Happy Tuesday and time for this week's colours at the colourQ! I would be so happy with a pair of these in each colour! 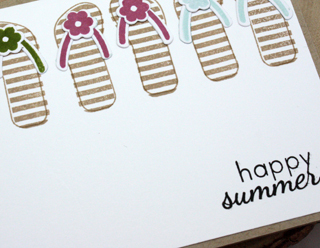 I was so inspired to create these flip flops on my card, so I pulled out my PTI Flippin' Out stamps and got to work. Hop on over to the colourQ to see what the rest of the Design Team has for your inspiration today! Hope you can play along! Adorable. Love those sweet little flip flops Tracey! Adorable!! Love my flip flops. LOVE those cute little flip flops! Soooooooooo cute! LOVING those flip flops!!!! Cute, cute, and more cute! This couldn't possibly be any more perfect for summer! LOVE! This is so sweet! Love the flip flops! LOVE the flip flop happy card, Tracey!! Beautifully done! It would be a happy summer with a flip flop collection like that! Love it! Fun colors, and even more fun flip flops. This card just screams summer to me. yay. Lovin' the flip flops! Great use of the colours! Perfect take on the inspiration colors and photo. Love it! Oh, what a fun card! I love all of your striped flip flops and your summer theme is fabulous! Nothing like a fun pair of flip flops in the summer! Cute card! What a fun card...love those flip flops! Fabulous flip flops Miss Tracey! I love them and would love to have a pair of each please. They made the cutest card.